CULTURE OF REVOLUTION · Customer Obsession Seek authenticity THERE ARE MANY REASONS to obsess over your customer, but the most important is the simple concept of authenticity. If you want to create a cultural connection, then, quite simply, you need to take an authentic interest in your customer. I had a chance to "hang out" with Shaheen Sadeghi, co-founder of Quick- silver. Shaheen lets the concept of cultural authenticity rule everything he does. He loves to describe the way Nike struggled and failed to build their way into the surfing market. 126 Basketball, tennis, running, soccer, hockey, football, and golf: these are just a few of the areas in which Nike merchandise reigns supreme. But af- ter countless attempts, Nike was never able to penetrate surf culture. Shaheen attributes this to Nike's lack of an authentic cultural connection. 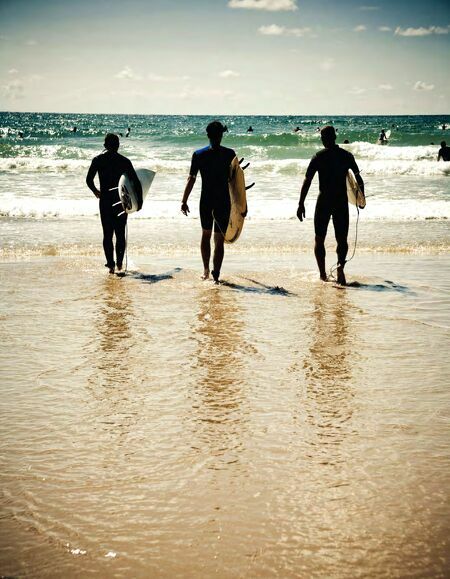 Surf culture is grassroots. It is less about the individual superstar and more about the lifestyle. Nike didn't get it. In the end, Nike bought Hurley to capture part of the market, but the Nike swoosh remains absent from the rip curl. Shaheen explained, "People are starting to really be a lot more connected to what is important to them. 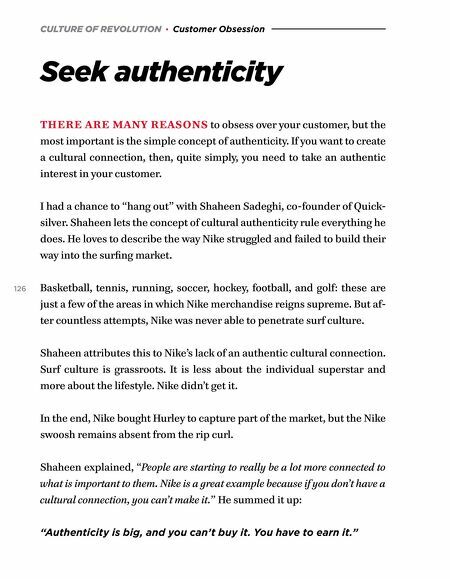 Nike is a great example because if you don't have a cultural connection, you can't make it." He summed it up: "Authenticity is big, and you can't buy it. You have to earn it."